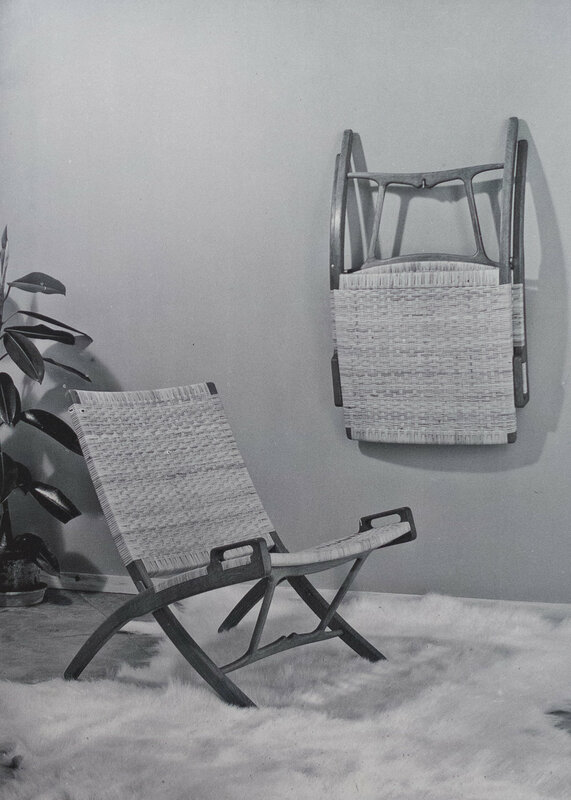 Although this is a folding chair it was not designed as a deckchair or even primarily for use outside but it was for a small apartment and was designed to be hung on the wall so it was out of the way until it was needed. 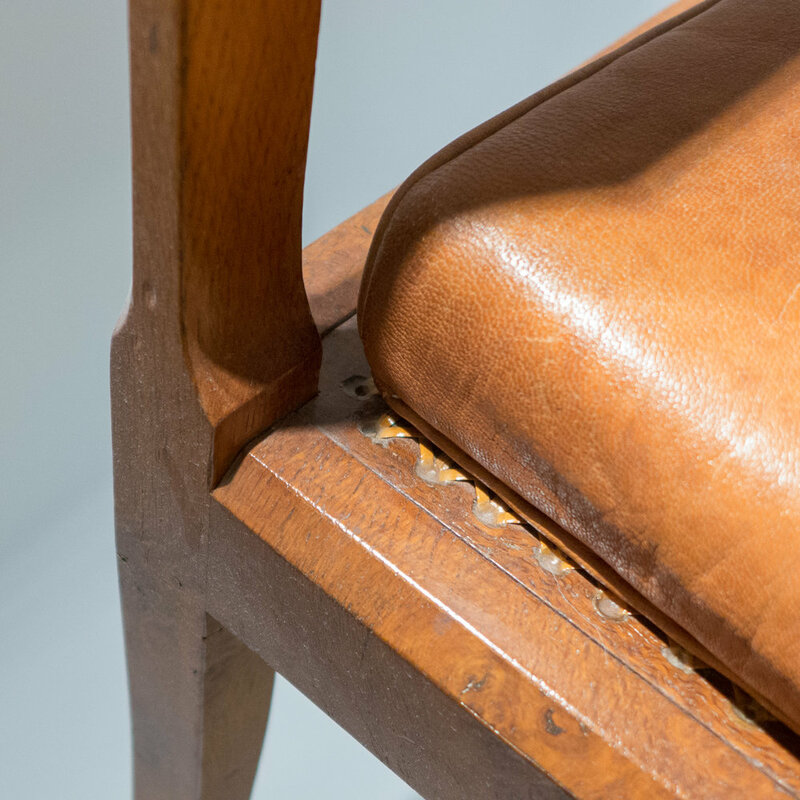 The cross bar below the seat is shaped and has curved cross struts to form a notch to keep the chair steady when it is hung over a single hook. 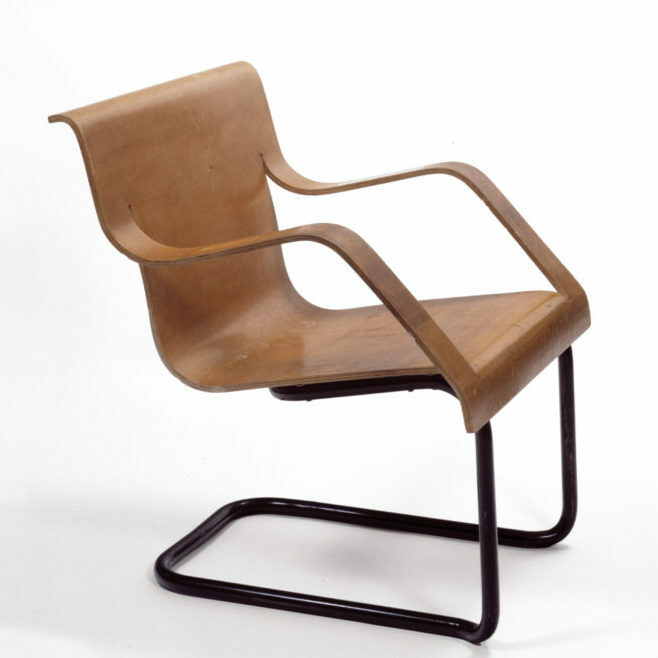 Deceptively simple with an open wooden frame for the seat and back, that are square and infilled with cane, and that cross over as an X shape when seen from the side. 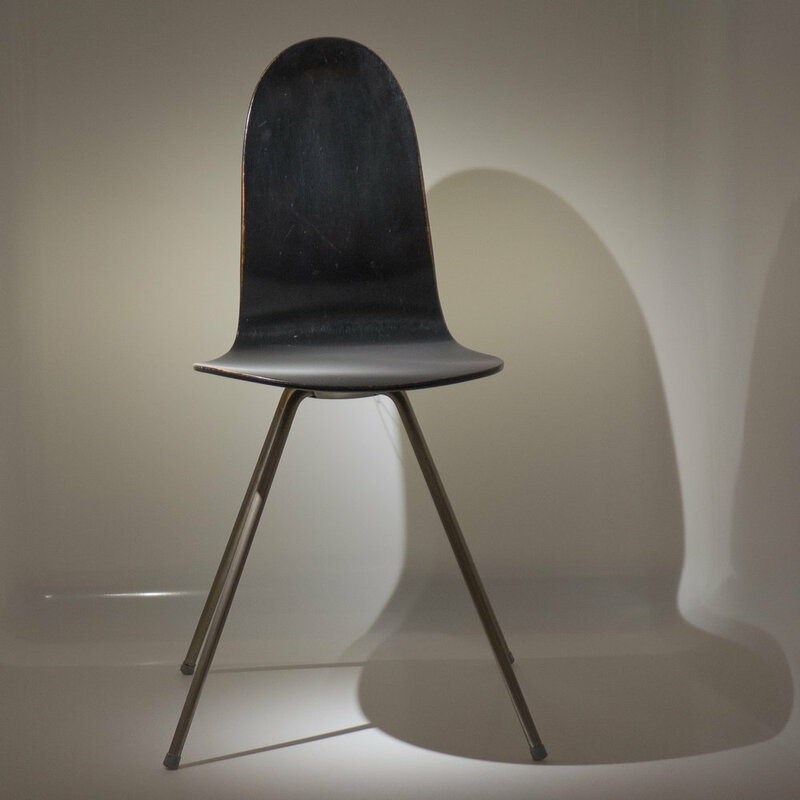 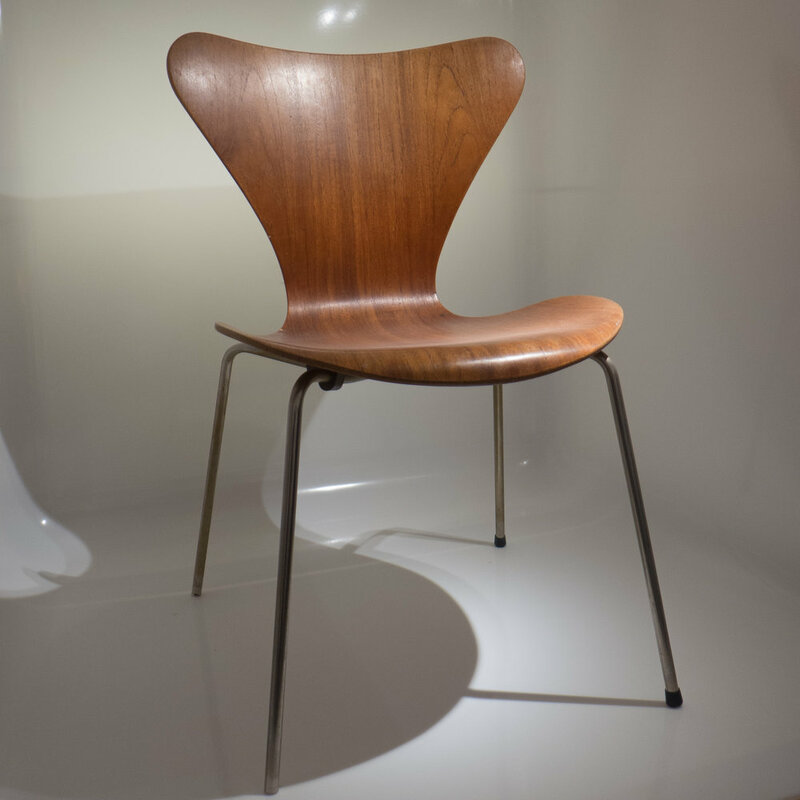 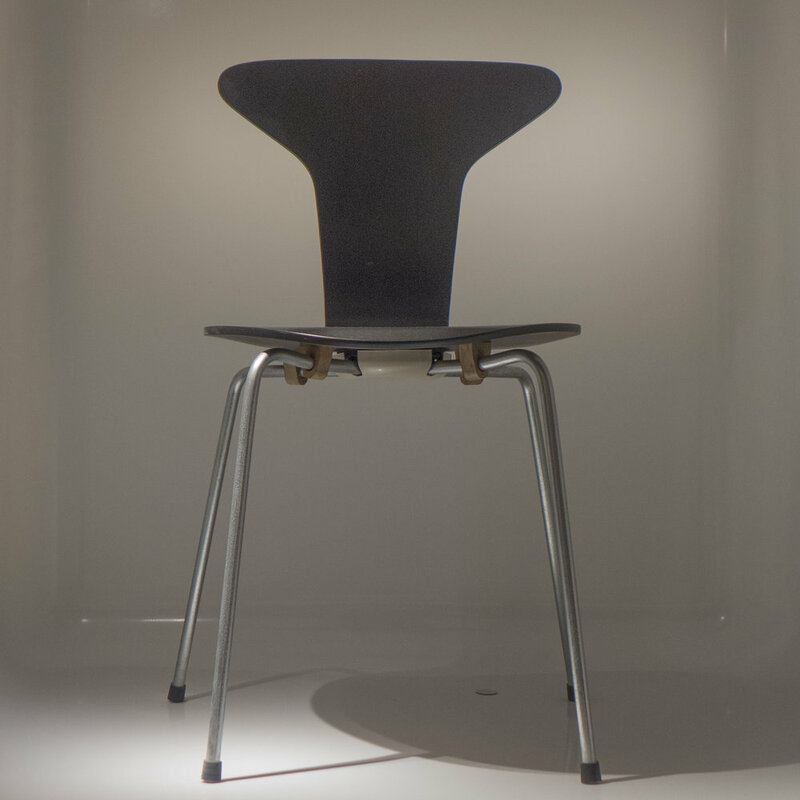 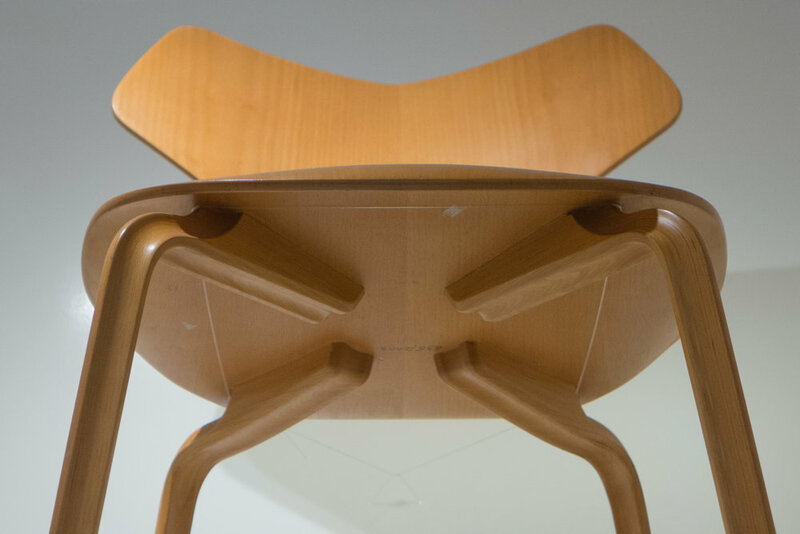 The back rest is concave and continues on down in a single curve to form the front legs of the chair and the seat running on down to form the back support is slightly convex. 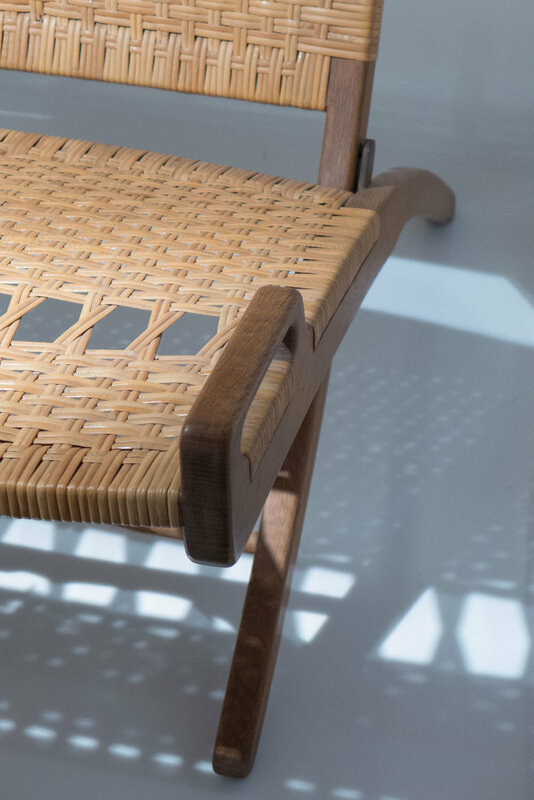 Where the design is ingenious is in the way the structure, the precise alignment of the key parts of the frame and a hinge or pivot at the centre, allow the chair to fold flat and stay flat when it is hanging. 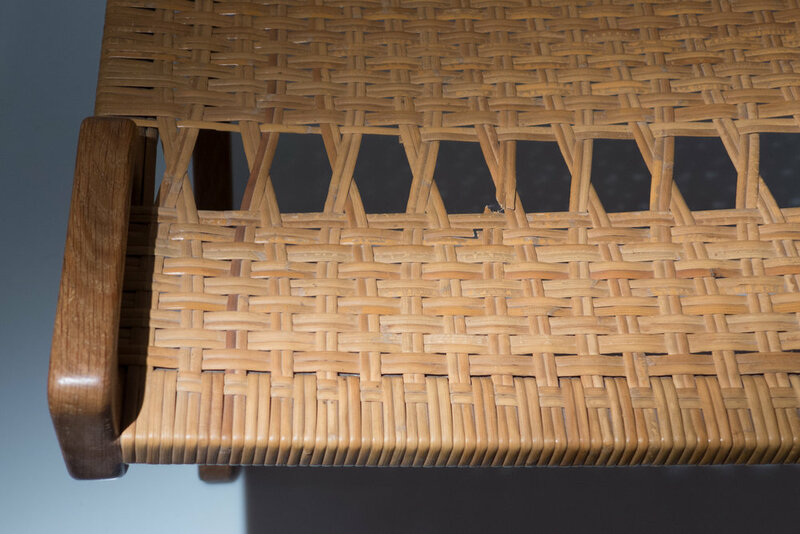 The frame also has to allow for the cane to be taken down through slots at certain points, rather than around the whole frame, to accommodate handles and so on. 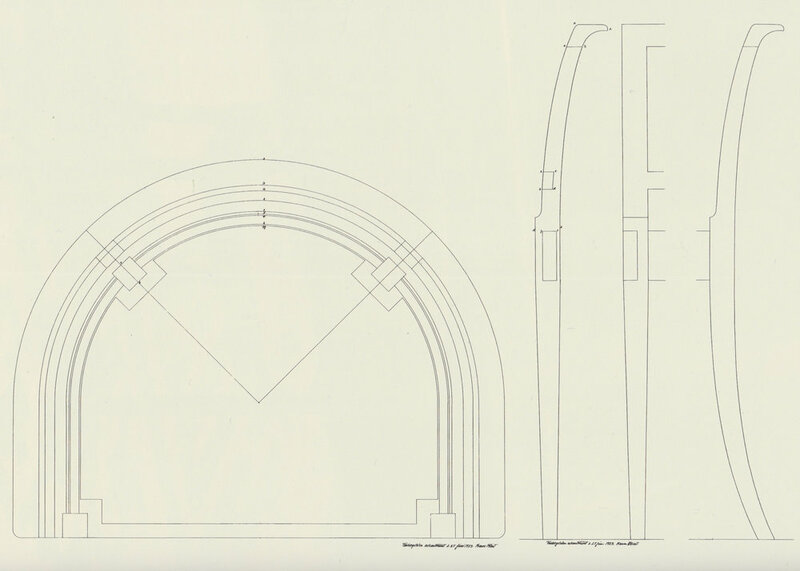 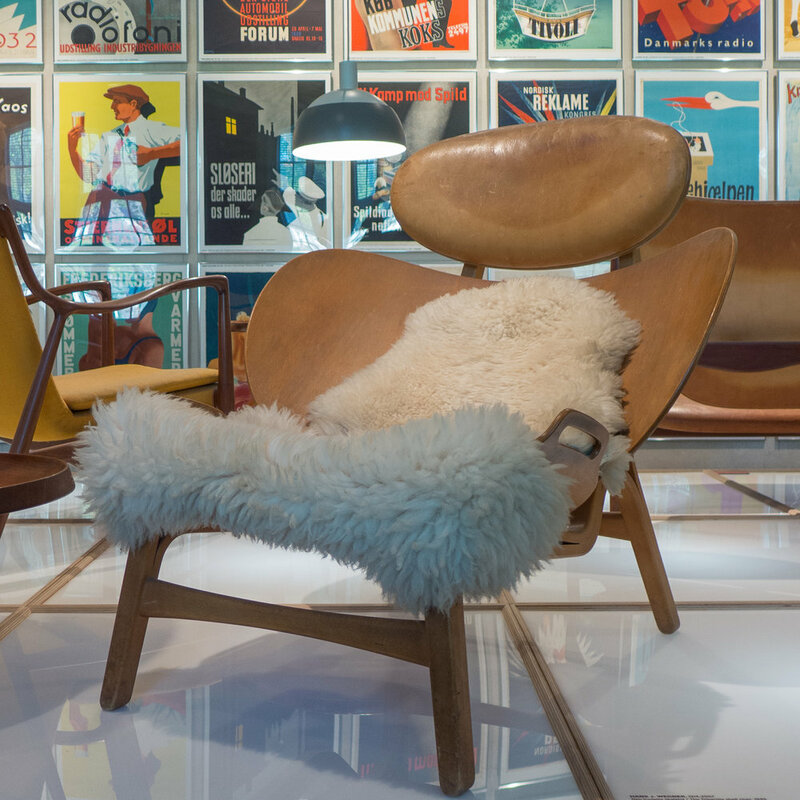 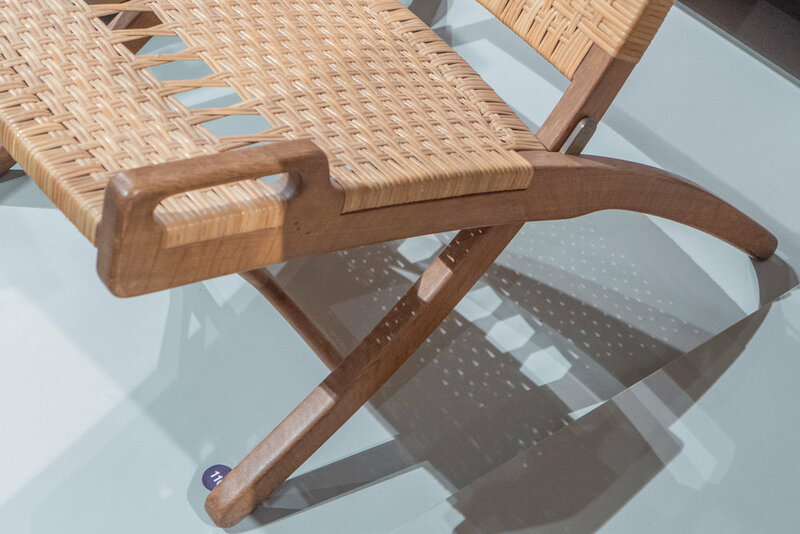 As with so many designs by Wegner it looks easy and simple when he has finished but take a step back to the beginning and try to design the same thing without any reference to his solution and you begin to see how he had such an amazing perception of three dimensional space. 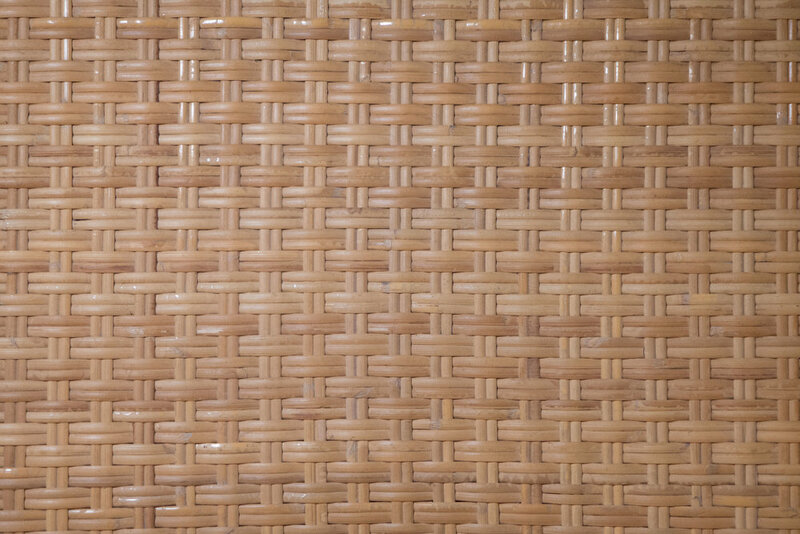 The impressive thing about any puzzle, say a complex crossword puzzle for example, is not that someone can solve it but the mind that created it. 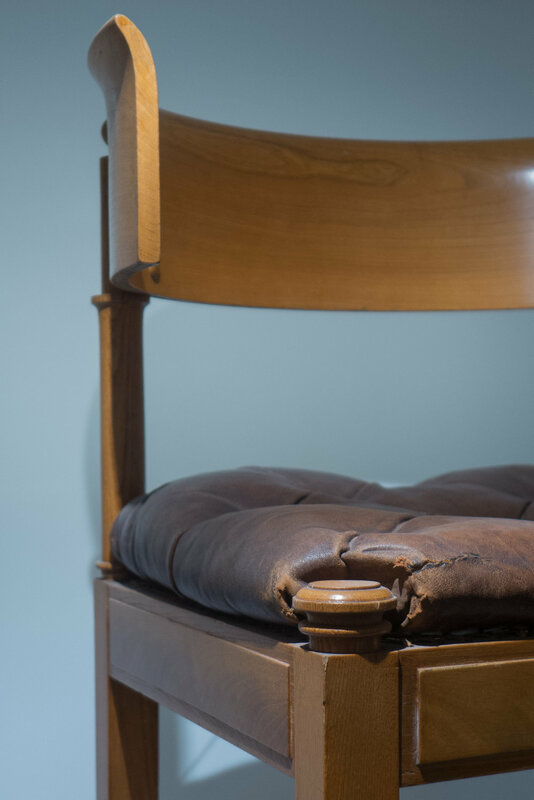 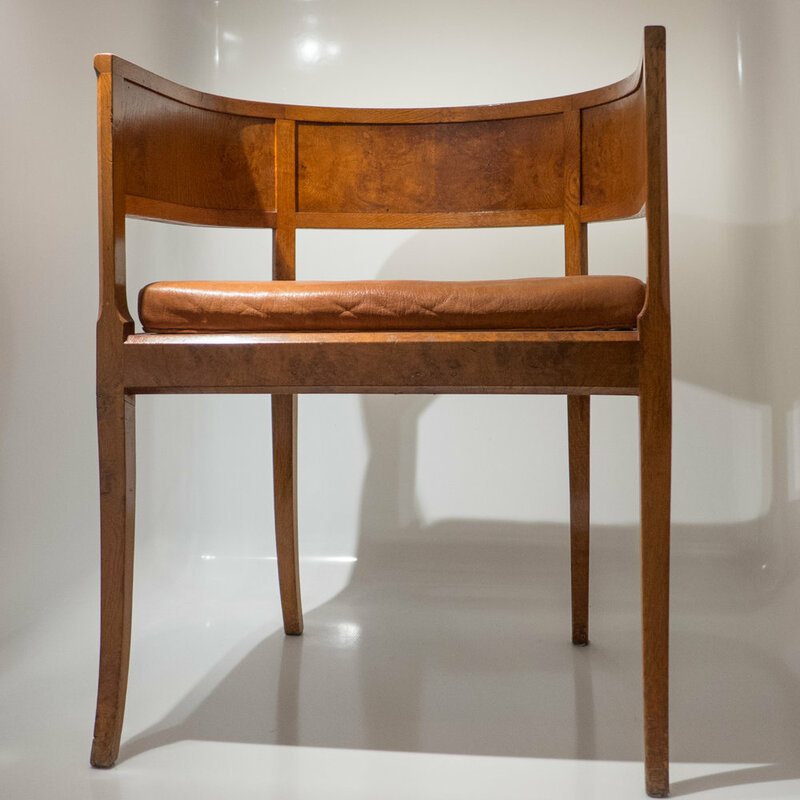 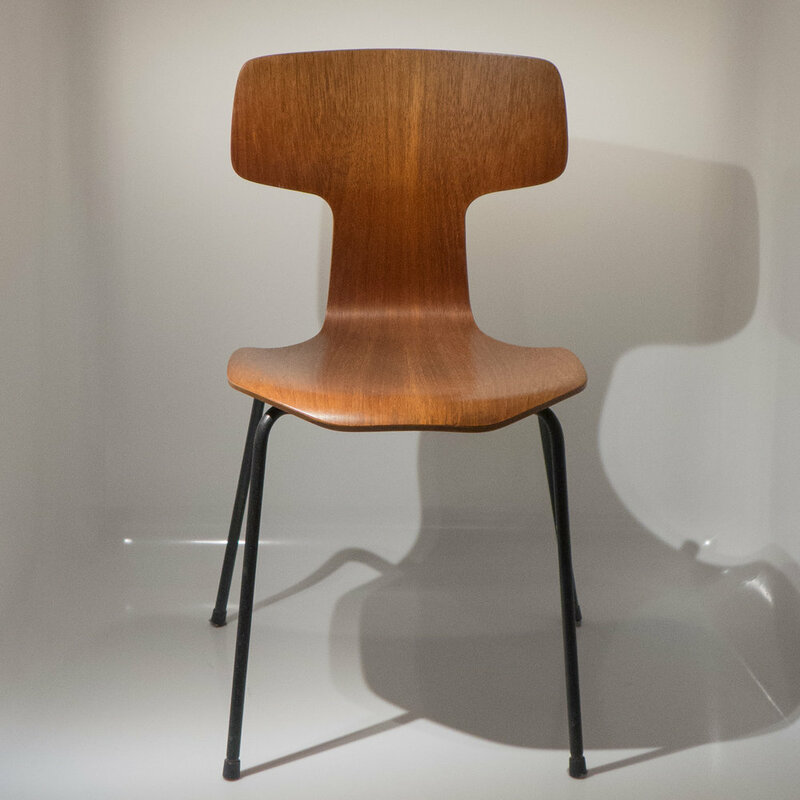 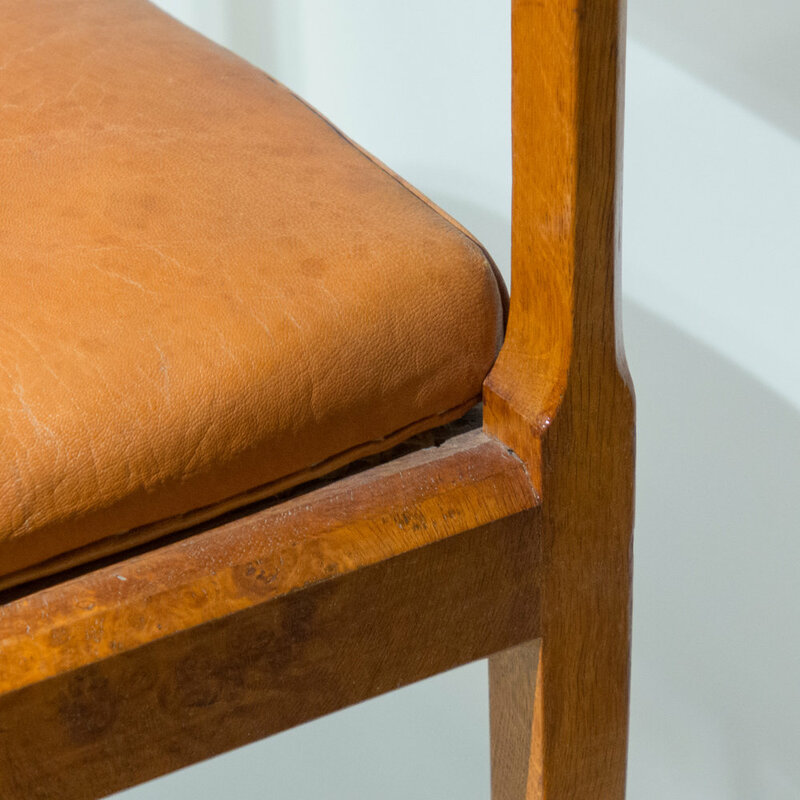 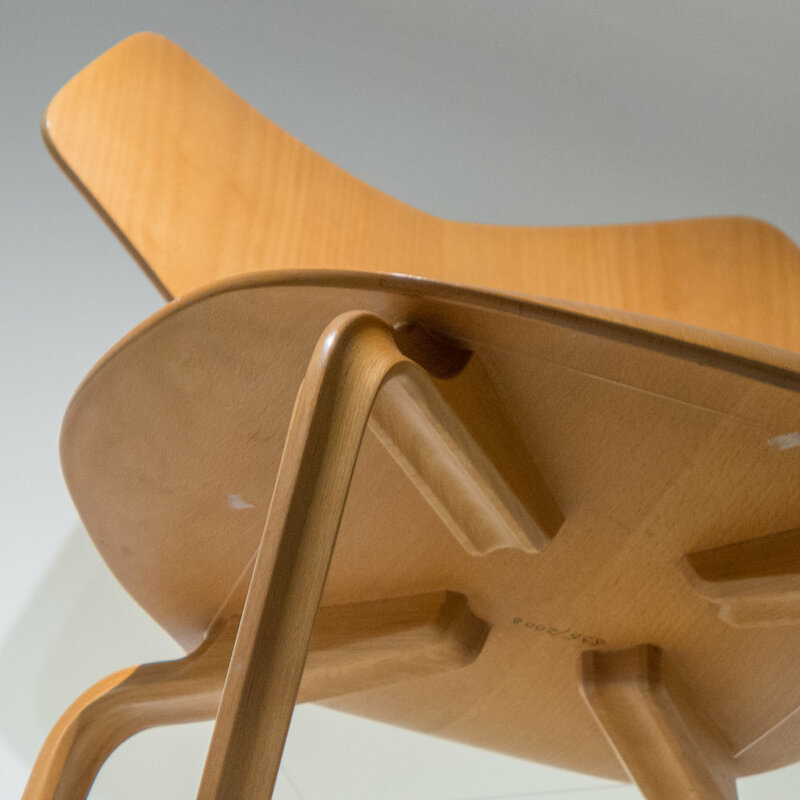 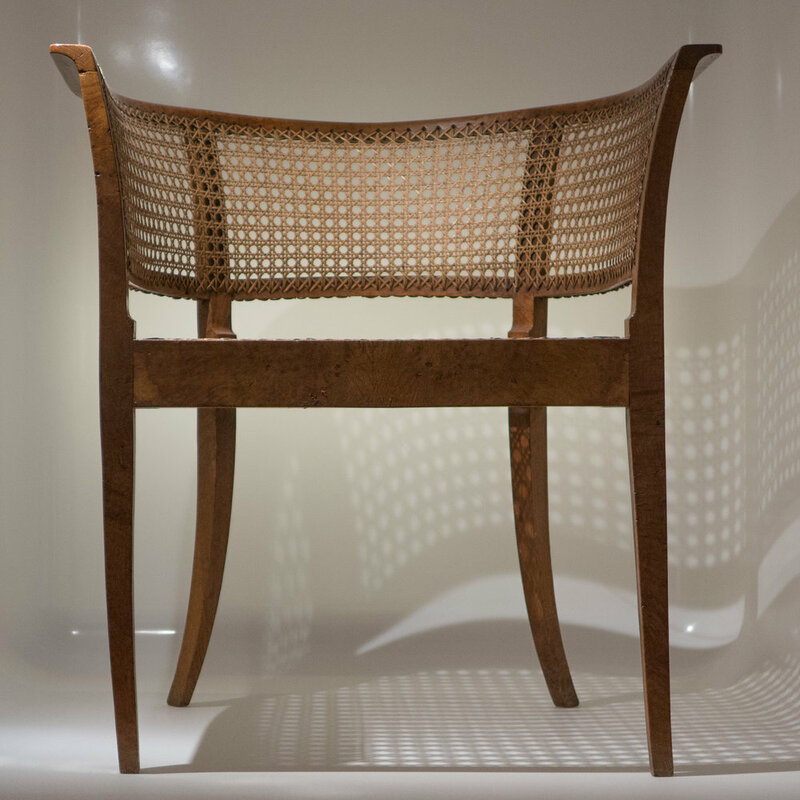 The Folding Chair, made by Johannes Hansen, was shown in the Cabinetmakers' Exhibition in 1949 and what now seems so incredible is that this chair was actually far from the star piece that year. 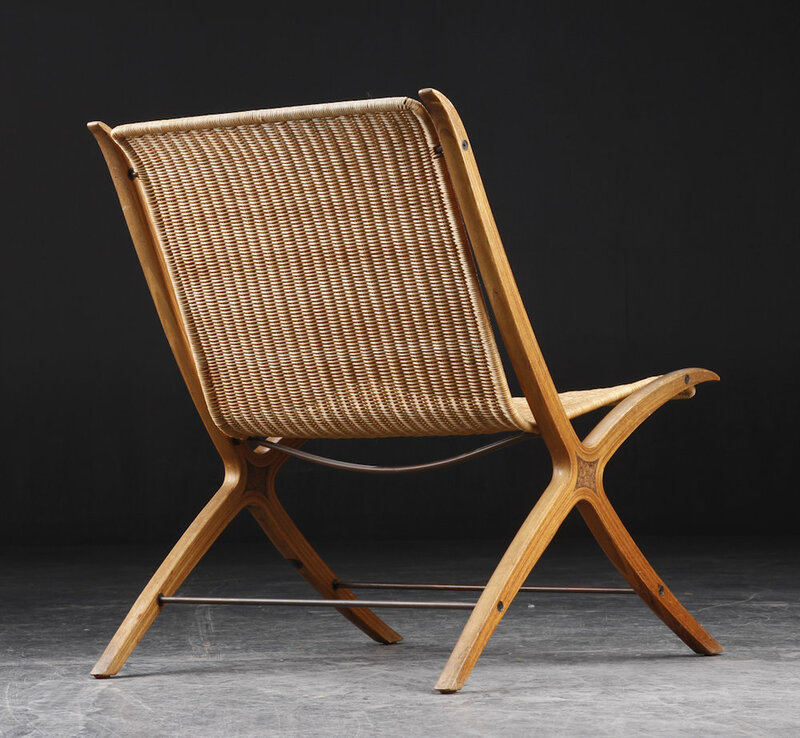 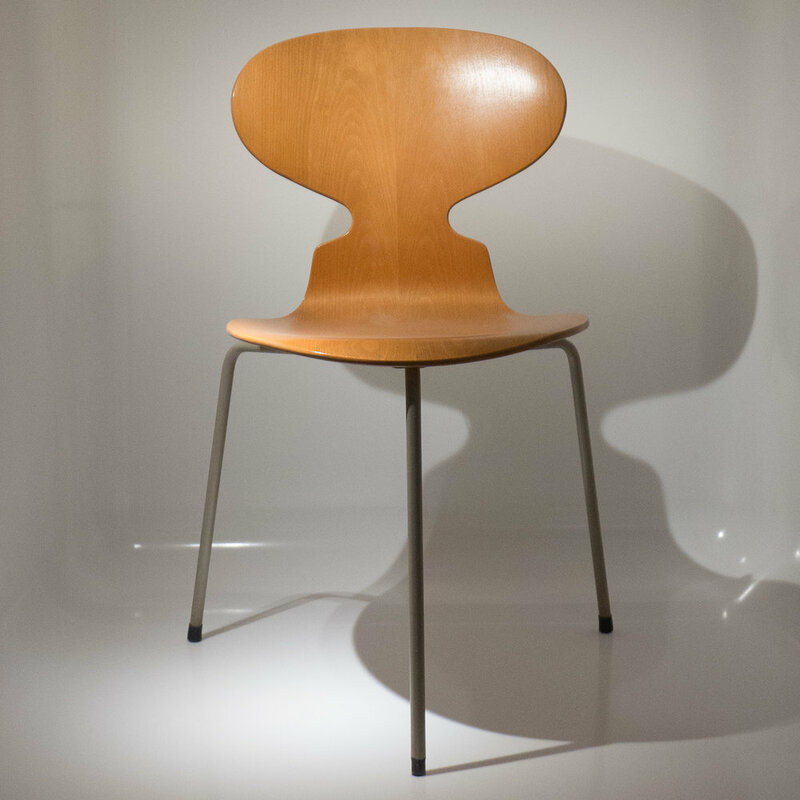 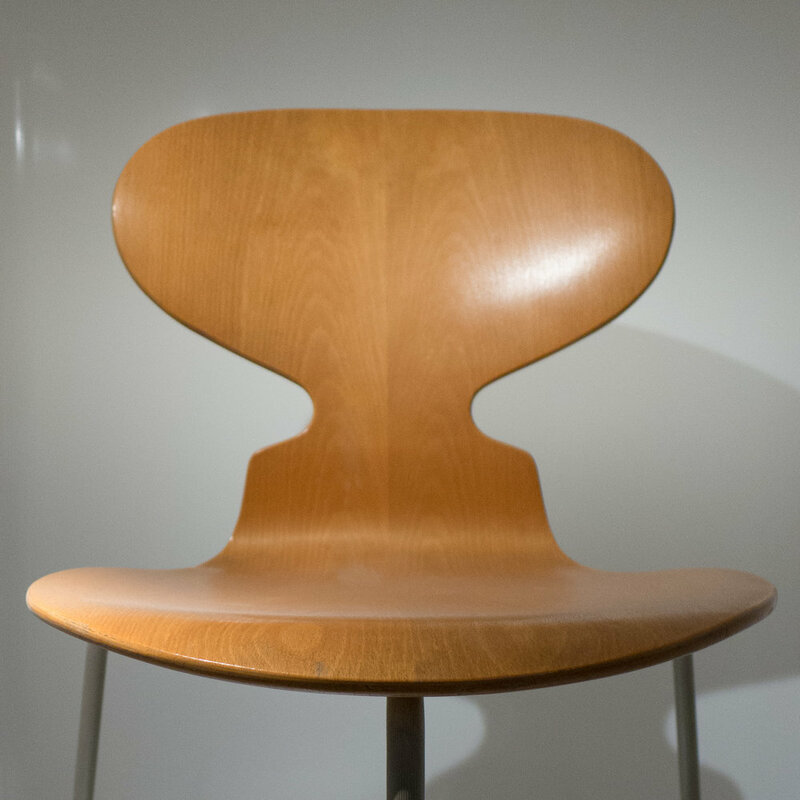 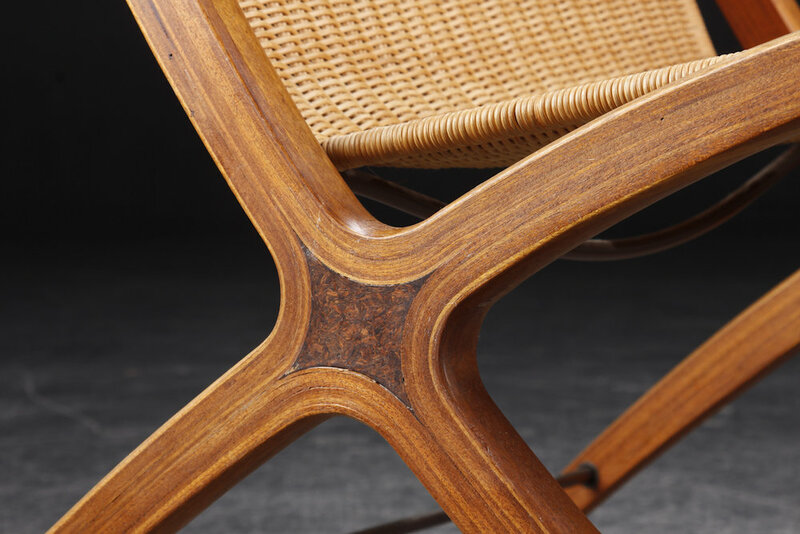 In 1949 Wegner and Hansen presented to the public The Round Chair and the tripartite Shell Chair. 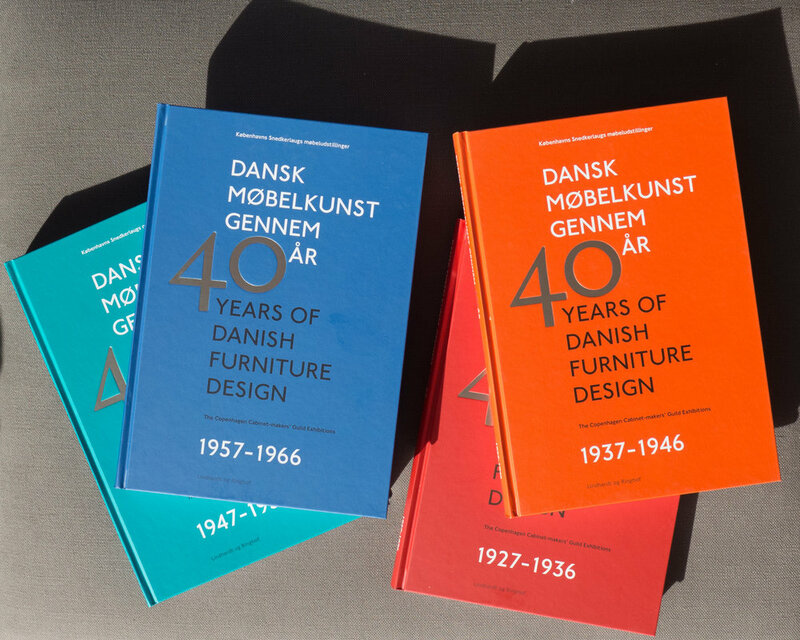 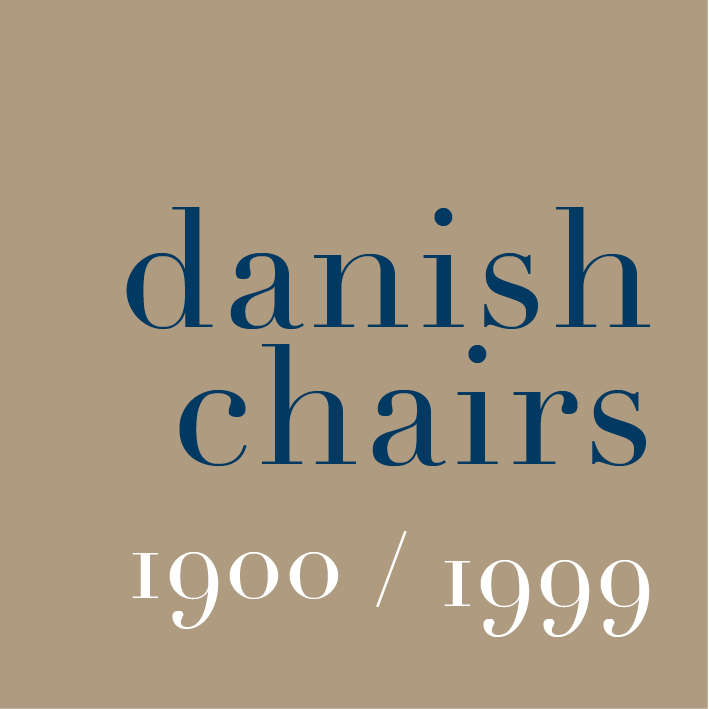 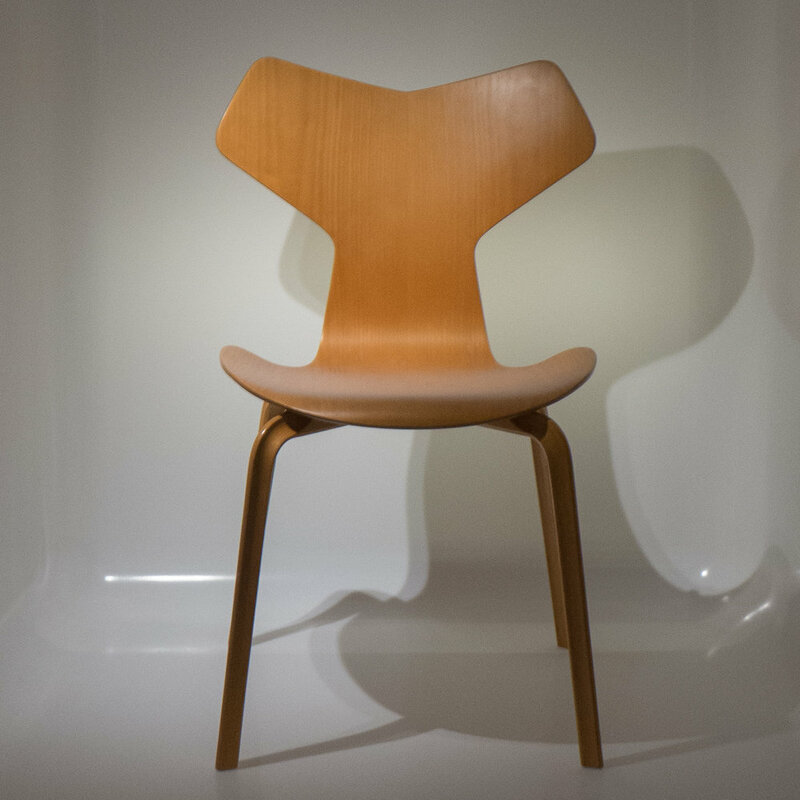 It is said by Christian Holmsted Olesen * that the Folding Chair is one of the designs by Wegner that was most plagiarised.